This entry was posted in altered art, Copic, SCRAPBOOK ADHESIVES BY 3L, Spellbinders and tagged blog hop, Christine Emberson, Clearsnap, Copic, Crafters Home, Flourishes, Kimberly Crawford, My Mind's Eye, Nestabilities, Sparkle N Sprinkle, Spellbinders, Windy Robinson, Worldwin. Bookmark the permalink. Beth I loved your tea cups. Very interesting card! Very pretty canvas. I love your color selections. I work with a Beth who loves an afternoon tea party, and has an eclectic collection of cups – much like the ones you have created! I love your card. The teacups look real! The way you stamp them, and then curled them a bit. Very clever! Lovely colour combinations and stacked tea cups just seem so right.I’m sure the canvas will come together when you least expect and its good to know that everyone sometimes just has to put their project to the side before it can be completed to their own special standard. Beth love how your victorian tea cups turned out! It’s my first time hearing about reverse stenciling and I will definitely need to google this. Great details with the embossing. TFS! I love it. What a great way to use the die. Love the look of the painted tea cups. I have a friend who collects tea cups I may need to come up with something for the holidays for her. Thanks for the inspiration. Love your creation, the colors and patterns on the teacups look like the ones on my granny’s old sets. Thank you for sharing and a chance to win. Love your canvas with the stacked tea cups. I love tea. Apparently you don’t need much time or many brain cells to do something beautiful. Love your patterned paper tea cups. TThe patterns chosen were lovely. Your set of beautiful stacked teacups is lovely Beth. I really like the stamps you chose, and was interested in the reverse stamping/embossing method you outlined. Thanks for sharing your project! So simple but so elegant. Blue is not one of my favorite colors but adding in some purple and the neutral background made it beautiful. Each tea cup looks amazing! gorgeous card. Beautiful and elegant. Love your idea. Beautiful and elegant. Love your idea. Thanks for sharing. Love your canvas, I think you did a gorgeous job with the tea cups. The embossing makes them look so much like real tea cups. Marvelous card! Love it just the way it is! The only thing needed is for some lucky person to receive it! What a lovely card, love the set of teacups and the colors of them with the flowers, very pretty, thank you for sharing it. What a lovely card! So inspiring! Love the way you decorated each of the cups. Love these teacups – I collect antique teacups and have a stack that looks a lot like your project! so precious – like fine china! I LOVE your card! It’s stunning – the cups are so Royal-Dalton-y!!! Fantastic card!!! Thanks for inspiration! Beautiful, yet whimsical! Perfect! TFS! The dies look great stacked up like that. Fab project that would look great on a kitchen wall. Thanks to all you talented ladies for giving us the chance of winning too. I love the way you’ve balanced the wobbly cups like that, the patterns are gorgeous too, just like you’d find on lovely, china cups. Your teacups are definitely elegant looking. My grandmother had teacups like those and looking at them and the design makes me remember having coffee with her when I was young. Had to have coffee as she knew I did not like tea. i am a tea drinker so this suits me just fine. and is another die set i just have to have. love how you embossed the cups, gave them dimension. stunning. I really like how you embossed them!! I will have to try that. love your card! it’s gorgeous!! The tea cups look so real!! Just gorgeous!! Sorry I commented in the wrong spot, put this comment in your stopper post, sorry!! Also love those stopper tops as well though!! Wish I would have had this die for my Mad Hatter Bridal Shower this Saturday!! Love your teacups! The flourishes and the flowers are beautiful! Thanks, Teresa E.
What a great card. I love how you’ve used the beautiful tea cup die. Your cups are gorgeous. These dies are wonderful. I love your embossing. Look like my grandmother’s china cups. Beautiful! TFS. Love the teacup die! Your card reminds me of tea cups my grandma used to have many years ago. Brings back fond memories!!! Thanks for the chance to win. Your stamping makes those cute little teacups so UNIQUE….love that idea! What an elegant card! I love the tea cups all stacked up. And the colors are fantastic. Great job. Love the patterns on the teacups. I think this is beautiful the way it is, but will be looking forward to see how you re-work it. Stunning! I like the stacked cups! The tea cups are just gorgeous! Love those beautiful stacked teacups, how fun! Stunning card. I love how you layered the teacups and saucers. Oh, I can hardly wait to get my own set of these teacup dies! Your “china” creations are SO beautiful! Wow, these would suit me to a tea! Love your china patterns. They look great! What a gorgeous stack of treasured antique tea cups — BEAUTIFUL!!! Makes me think of the elderly lady my Mom watched over, visited with and took groceries to every week when I was a little girl. She was my Mom’s best friend’s Mom. I always got to have coffee with them, served in beautiful antique cups on saucers and a sweet treat. My “coffee” was mostly milk, but she’d set a beautiful table, including antique cream and sugar set, which was gifted to me when I got married years later! Still love how it ensures I’ll never forget how special she was in my life! Great job Beth! It reminds me of my mother’s tea cup and saucer collection. Thank you for sharing your projects to inspire us. Thank you Spellbinders for these wonderful dies to create with. Love the card as it is! Sweet card.. makes me want to have a tea party! Oh, I love this! I never realized how tea cups reminded me of fall and winter. And I have a cabinet full of all sorts of herbal teas and flavored green teas that I start drinking as soon as the weather gets cool. I love the idea of a sit-down with a friend over a cup of hot tea at this time of year. It also reminds me of the Aunt Dimity series of light mysteries that take place in England. It all gives me such a feeling of comfort. Thank you for the reminder. Beautiful job. Love your card and the die cuts are great. You managed to make several teacups that look like they came straight out of my Grandma’s collection – loved the card. This is so pretty! LOVE how you stacked them up! 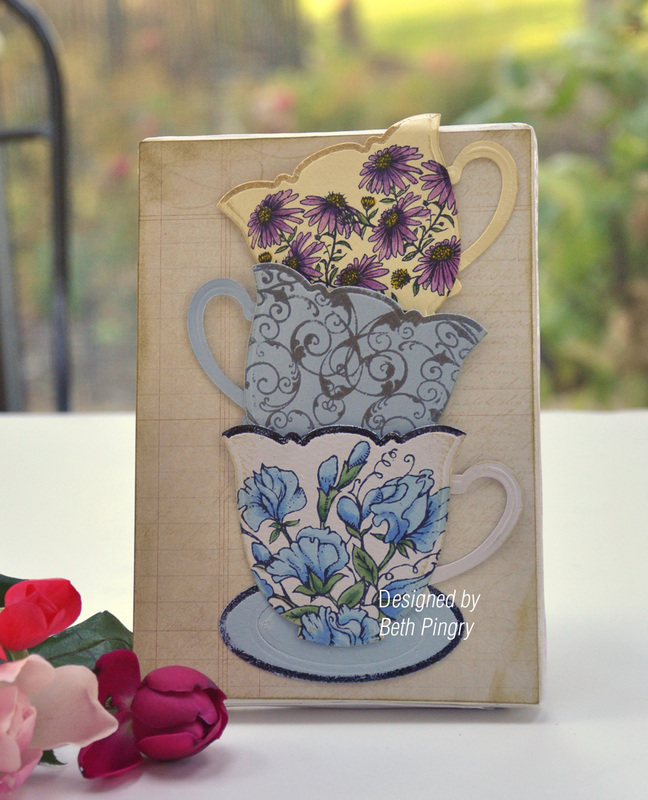 WOW—beautiful card–reminds me of my grandmother–she always would drink her tea from beautiful cups just like them…. Love the vintage look!! And, LOVE these cups…how cute! I love your card and I am loving the teacup die. Wow I feel like I just opened the china closet to get out my tea cups. Beautiful project. These are great dies! Great use of the tea cups and I love the dp! Just beautiful! I know what you mean , I love it and you should be very proud, before I read you post I knew this is something I would want to do with this die. This card reminds me of a tea cup collection that belongs to one of my best friends. Absolutely wonderful! I meant to say canvas – not card! Either way, it is beautiful! I just love these dies, as they can be used for so many awesome things. They´re just sooo cool. I love the way you´ve stamped all your cups, that makes them look totally as the ones I remeber my grandmum had, when I was a kid, which she used, when they got fine visitors LOL. Love the look of tour card, really great work. Absolutely love your card. Just like the teacups in my cupboard…stacked! I love them! and in my little state we have 4 crafters home vendors! yipppeeee! perfect for papaer n fabric!!! Gorgeous cups!!! Looks like Saturday afternoon with my Gram and her favorite teacups! Beautiful! I, too, think it looks great just the way it is! Love the papers you used and embossing around the rims gave them just the right touch! Great Job!! feminine yet stylish card. Beth, this card are so adorable! Oooo this dies was in my wish list. I love this dies. Beautiful! Love the Colors, Too! Thanks! Pretty feminine stacked teacups! I love the dimension you added. They really do look like elegant Victorian tea cups, love the rims. Love these dies. 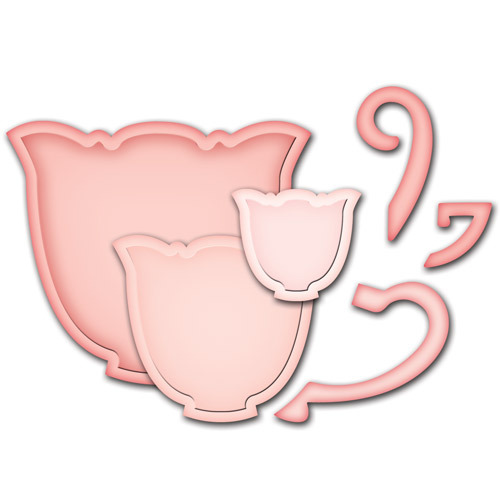 i have one word to describe your teacups—ADORABLE!!!! TFS! Oh my goodness Beth! This is so gorgeous! I don’t think it needs anything else! I want to make one just like this – I collect teacups and this altered canvas would be perfect in my kitchen 🙂 Thanks for the fabulous inspiration! Gorgeous Beth. I love the look of the stacked teacups! very pretty. Ooo, splendid just the way it is, Beth! it’s marvelous to see what you’ve done with the die I designed! So special! May I add it to my new Nested Tea Cups art gallery on Layers of Color?